So I'm back from the most FABULOUS vacation ever...did you miss me? 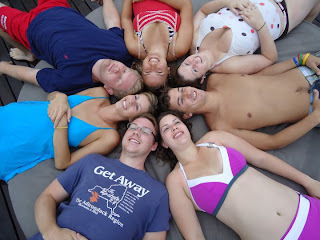 Last week I went to Costa Rica with 6 of my friends from college. 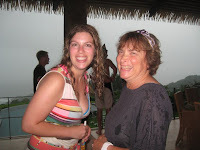 Sigal's family just finished building a house on the Pacific Coast near Uvita, so when she sent out the email invite "SB 1.o" (Summer Break 2010) I was in. (We all know each other from Ski Team - go BUSki!) 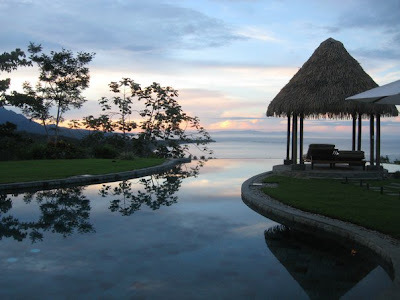 We arrived at Villa Mayana (aka the H. family's personal paradise on top of a mountain) very late Friday night. The sleepyness that had infected us towards the end of the 3-hour drive was immediately banished by the excitement of vacation. Count to ten, and we were bathing-suits-on-and-jumped-in-the-pool. Within a half-hour we were well established in the hot tub, just wondering what sights morning light would bring. And of course, every day involved extensive pool and gazebo time. 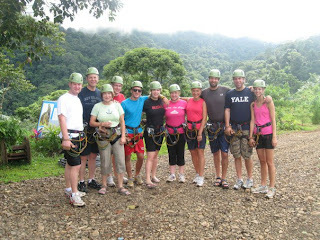 We went on a zip line rain forest canopy tour. It was AWESOME. Sitting in the back of a truck, we bumped our way up a mountain, holding on for dear life (best upper body workout I've had in a while!). We were strapped into harnesses (in varying degrees of comfort depending on our respective levels of sunburn...), and told to jump off platforms high in the trees of the rain forest. Ok, if you say so! One afternoon we went to a cove beach with caves. The caves were cool, reaching through the mountain and to the ocean on the other side. But I'm not a cave fan...so after poking my head in, ventured on to explore the rocks. I tentatively tiptoed through the tidepools, trying to tread lightly but inevitably sending squillions of crabs skittering away in terror with my every footfall. Then into the waves we went - diving and shrieking and body surfing in the spray of crashing whitewater, wondering if this was the beach where pirates landed, or if the next wave's whitewater was holding a shark... Being myself, I did a bit of running as well. Pool running that is. 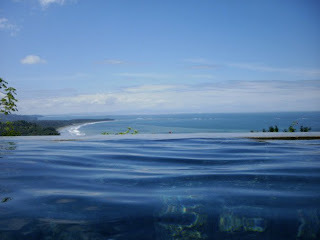 I usually dislike pooling, but doing it in an infinity pool overlooking the Whale's Tail surrounded by widlflowers and butterflies (did you know that there are more butterfly species in Costa Rica than in all of Africa?) and listening to country music on the outdoor speaker system isn't half bad. We saw a bit of wildlife as well. A bajazillion crabs all over the beaches, and this lovely guy when I reached for a cereal bowl one morning. Yikes! Bowls = taken. (That is my just-woke-up, slightly panicked face. You're welcome.) My three library travel books came in handy - Parc National Manuel Antonio did not dissapoint (though if you're going, do not park at the first place they tell you to! Wait until you see the park gates!). Within 5 minutes we saw our first sloth, and Scott's life was complete. As we ventured deeper into the uncharted wilderness (or along the well-maintained path, as the case may be), our vulnerable group of 4 was set upon by a tribe of viscious monkeys. First the mother with her baby on her back lured us into her trap. Then she called in the re-inforcements and they tried to block our path! Luckily we put up a brave fight and were able to break through their defences and continue on our way, shaken but unscathed. Basically it was a week of relaxing awesomeness. Ping-pong battles to napping (sometimes at the same time - take a lesson from Alison!). Hiking and surfing and just playing around. And we all made it back in one piece. Including the H. family, there were 11 members of our elite extreme vacation squad. We came from all over: Boston, Israel, London, Shanghai, San Diego, Philadelphia, and DC of course! Like Survivor, our group shrunk as the week progressed. The first to go were Jess and Seth - one to work and one to law school. The next day we dropped Sean off at the Quepos airstrip on our way to Parc Manuel Antonio (another lost to the pursuit of a law degree). On Thursday, Ron's plane took off. And alas, on Friday it was time for Scott, Allison and I to say goodbye to the most luxurious vacation we had ever known. Not to get all cheesy on you, but I am soooo lucky to have such awesome friends (not because they have fabulous houses, but because I love spending time with them!). Ahhhh, vacation!